The Lions and Pumas are in a cat fight for one of the semi-final spots. Four points clear of their hosts, the Lions are in a more favourable position to advance. Should the Pumas win in Nelspruit, they will either overtake the Lions or draw level with them in the standings. That will make for an interesting game at Loftus because the Bulls are also not yet secured safe passage through to the knockout stage. Earlier in the week, Pumas coach Jimmy Stonehouse likened this clash to a quarter-final. But while the Pumas deserve credit for being in playoff contention after the disruption caused by the departure of ex-coach Brent Janse van Rensburg, their campaign is expected to come to an end against a Lions side boosted by the return of Bok duo Elton Jantjies and Lionel Mapoe. The Lions have not been firing on all cylinders so far, but they’ll be hoping to signal their intent with a solid performance on the road. A big win here could be just the spark the Lions need to hit top form and with the semi-finals looming, it couldn’t come at a better time. Pumas – 15 Devon Williams, 14 Morné Joubert, 13 Neil Maritz, 12 Ryan Nell (c), 11 Ruwellyn Isbel, 10 Chris Smith, 9 Stefan Ungerer, 8 Francois Kleinhans, 7 Willie Engelbrecht, 6 Marnus Schoeman, 5 Cameron Lindsay, 4 Le Roux Roets, 3 Marné Coetzee, 2 Marko Janse van Rensburg, 1 Morgan Naudé. Subs: 16 Simon Westraadt, 17 Andrew Beerwinkel, 18 Stefan Willemse, 19 Jeandré Rudolph, 20 Abri Griesel, 21 Kobus Marais, 22 Henco Marais. Golden Lions – 15 Sylvian Mahuza, 14 Wandisile Simelane, 13 Lionel Mapoe, 12 Howard Mnisi, 11 Courtnall Skosan, 10 Elton Jantjies, 9 Nic Groom (c), 8 Hacjivah Dayimani, 7 James Venter, 6 Hanko de Villiers, 5 Marvin Orie, 4 Rhyno Herbst, 3 Jacobie Adriaanse, 2 Corne Fourie, 1 Sti Sithole. Subs: 16 Pieter Jansen, 17 Danie Mienie, 18 Chergine Fillies, 19 Driaan Bester, 20 Len Massyn, 21 Dillon Smit, 22 Shaun Reynolds. Defeat for the Sharks could potentially cost them a home semi-final, but that’s unlikely to happen. Griquas have been well below average, losing four of their five matches, while the Sharks have won four and lost one. The Sharks should collect maximum log points in Kimberley, which will see them provisionally go top of the log ahead of Western Province. That will put pressure on Province to win away at Loftus, although just a losing bonus point will be enough for the Cape side to regain top ranking. Sharks boss Robert du Preez has named a strong side for the clash. In an interesting twist, Curwin Bosch has been selected at flyhalf ahead of Rob du Preez, who shifts to inside centre. Exciting youngster Aphelele Fassi starts at fullback, with S’bu Nkosi on the right wing. The match 22 has also been boosted by the inclusion of Jean-Luc du Preez, who is back from injury. Things could get messy for Griquas against a star-studded Sharks outfit. Griquas – 15 AJ Coertzen, 14 Ederies Arendse, 13 Kyle Steyn (c), 12 Andre Swarts, 11 Enver Brandt, 10 George Whitehead, 9 Zak Burger, 8 Conway Pretorius, 7 Sias Koen, 6 Wendal Wehr, 5 Pieter Jansen van Vuuren, 4 Sintu Manjezi, 3 Ewald van der Westhuizen, 2 Khwezi Mkhafu, 1 Devon Martinus. Subs: 16 Liam Hendricks, 17 Nicolaas Oosthuizen, 18 Jonathan Janse van Rensburg, 19 Eital Bredenkamp, 20 Louis Venter, 21 Stephan Janse van Rensburg, 22 Edwin Sass. Sharks – 15 Aphelele Fassi, 14 Sbu Nkosi, 13 Jeremy Ward, 12 Rob du Preez, 11 Lwazi Mvovo, 10 Curwin Bosch, 9 Louis Schreuder, 8 Dan du Preez, 7 Tyler Paul, 6 Jacques Vermeulen, 5 Hyron Andrews, 4 Gideon Koegelenberg, 3 Coenie Oosthuizen, 2 Akker van der Merwe, 1 Juan Schoeman. Subs: 16 Chiliboy Ralepelle, 17 Thomas du Toit, 18 JJ van der Mescht, 19 Jean-Luc du Preez, 20 Grant Williams, 21 Marius Louw, 22 Kobus van Wyk. The north-south derby is the biggest Currie Cup game of the weekend, with Western Province set to face the sternest test of their title credentials yet. The reigning champions have secured resounding victories over every other side this season. However, against a well-rested Bulls side whose last game was a month ago, Province will have their work cut out for them as they look to maintain their perfect record. As it stands, one log point separates the Bulls and Lions in third and fourth position respectively. While a bonus point will be enough to book them a place in the semis, a win will mean that the Bulls finish third ahead of the Lions. The Bulls have blown hot and cold this season, but a win at home against their arch-rivals would give them much-needed momentum going into the playoffs. And in an attempt to achieve that, coach Pote Human has selected returning Springboks Ivan van Zyl, Marco van Staden, Trevor Nyakane and Embrose Papier. WP coach John Dobson has picked Damian Willemse, Sikhumbuzo Notshe, Wilco Louw and Ruhan Nel, who were released by the Springboks for Currie Cup duty. 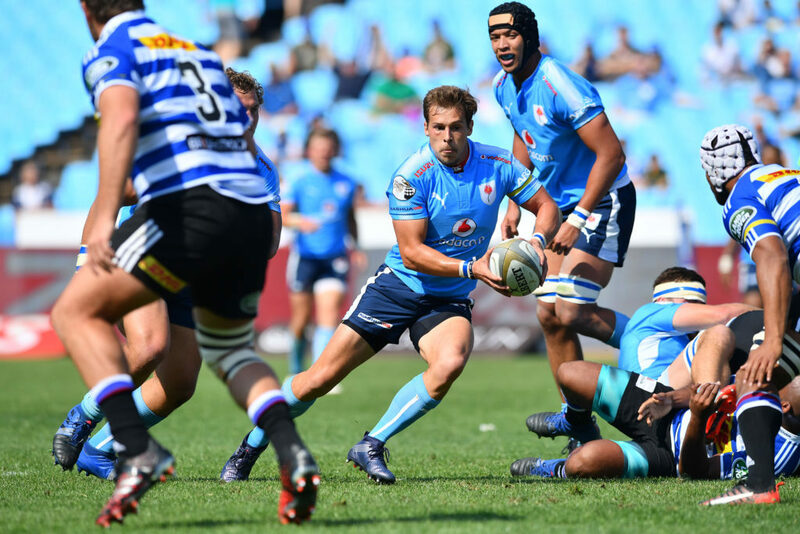 Blue Bulls – 15 Divan Rossouw, 14 Jamba Ulengo , 13 Jonny Kotze, 12 Franco Naude, 11 Jade Stighling, 10 Manie Libbok, 9 Ivan van Zyl, 8 Hanro Liebenberg (c), 7 Marco van Staden, 6 Ruan Steenkamp, 5 Eli Snyman, 4 Hendré Stassen, 3 Trevor Nyakane, 2 Jaco Visagie, 1 Matthys Basson. Subs: 16 Edgar Marutlulle, 17 Dayan van der Westhuizen, 18 Ruan Nortje, 19 Nic de Jager, 20 Embrose Papier, 21 Tinus de Beer, 22 Dylan Sage. Western Province – 15 Dillyn Leyds, 14 Sergeal Petersen, 13 Ruhan Nel, 12 Dan du Plessis, 11 SP Marais, 10 Damian Willemse, 9 Herschel Jantjies, 8 Sikhumbuzo Notshe, 7 Ernst van Rhyn, 6 Kobus van Dyk, 5 JD Schickerling, 4 Chris van Zyl (c), 3 Wilco Louw, 2 Scarra Ntubeni, 1 Ali Vermaak. Subs: 16 Chad Solomon, 17 Caylib Oosthuizen, 18 Neethling Fouché, 19 Salmaan Moerat, 20 Jaco Coetzee, 21 Paul de Wet, 22 Josh Stander.